Last summer, my dad and I were heading to a Wichita Wingnuts game. When we got off the interstate, my dad saw a sign by a church with Darryl Strawberry's picture on it. He pointed it out to me, but it was too late and I did not see it. My dad only caught part of he sign and he knew Darryl was coming to Wichita and that was about it. When I got to the ballpark, I hit up Google to see what it was all about. What I learned was that Darryl was going to be preaching at that church. I am not much of a church-goer myself, but I instantly knew I was going to be in church in Wichita that Sunday. The church it was at did a really good job hosting the event. They invited everyone to wear their favorite jersey that day and to stay after the service for ballpark snacks and to meet Darryl. They even lead off the service by singing "Put Me In Coach". Darryl preached for about an hour and, even though I don't think it was the best message for the under 12 crowd, it was still a good service. Everyone there wanted to meet Darryl after the event. Somehow, we ended up towards the front of the line. That was a good thing as it was the slowest moving line ever. There was a professional photographer there taking free pictures and that was what was slowing the line down. We were about forty people deep and it took us about forty minutes to get through it. I felt sorry to 200+ people behind us. But, we made it through and Darryl was kind enough to sign a card for each of us and take a picture with us. When I post the next card of Darryl, I will show the picture, too. When we were heading back home that day, my wife was looking at the signed cards and she commented on this one. She was wondering why I got this card signed since it was so dinged up. I explained to her that I pulled this card out of a pack thirty years ago when I was six. 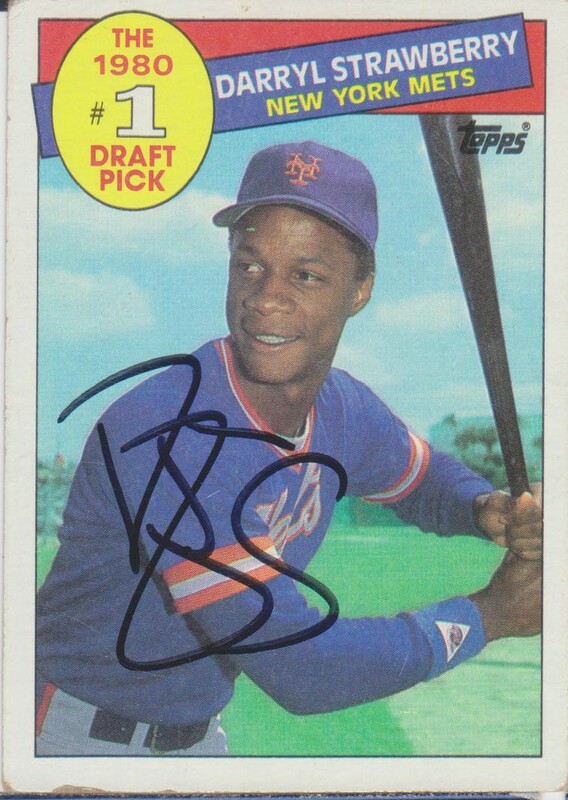 When I think of a Darryl Strawberry card, this is the one I think of and that is why I wanted it signed. Luckily, this card looks better than most of cards I have from then. This post is just like the post from yesterday where I got a players '81 Donruss signed through the mail and then got them in-person a few years later. It was less of a gap for Leon Roberts, though. I got the '81 D signed in 2012 and then got this card signed in 2015. I didn't actually get this card signed, my best friend did. We were at a Sacramento Rivercats game and he was nice enough to 'graph the visitors while I got the 'Cats. That is basically how it is if you go to a game with me; I am going to put you to work. Leon was coaching for the Fresno Grizzlies at the time and he signed three cards. Leon played in the Majors for eleven seasons, yet I hardly have any cards of him. The only two Major League cards I have are this one and the '81 D. I had to dig up a Senior League card and minor league coaching card just to have three for him to sign in Sacramento. Leon is now a coach in the Royals system. I saw the Royals practice this spring and I didn't take any cards of Leon because I have none left of him. Leon finished his career a Royal. He was traded to them by the Blue Jays for Cecli Fielder. I never knew Cecil was in the Royals organization. 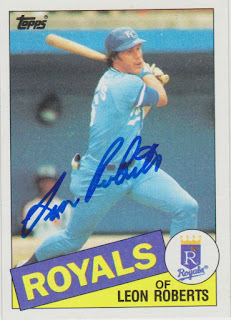 He got into 113 games with the Royals and he hit .252 with 8 home runs and 27 RBI. Here is the second card of Danny Darwin that I have posted on here. 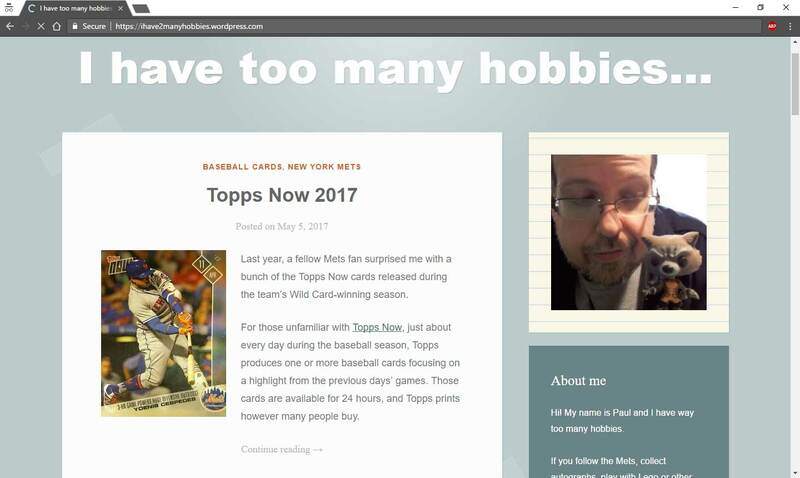 The first one, his '81 Donruss, was posted almost seven years ago. That one was obtained through the mail. This one, and the next two, were signed at Spring Training this past March. 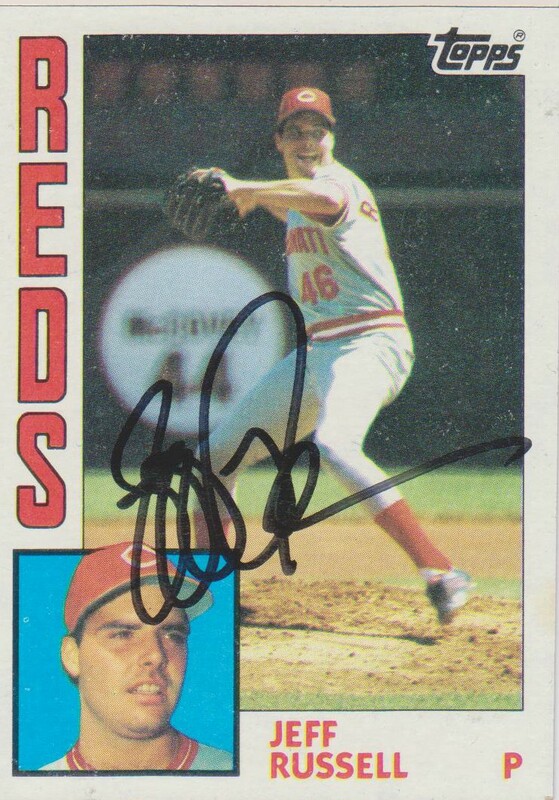 Danny is the pitching coach for the Reds AA affiliate in Pensacola and he was nice enough to sign for me during minor league workouts the day I was there. 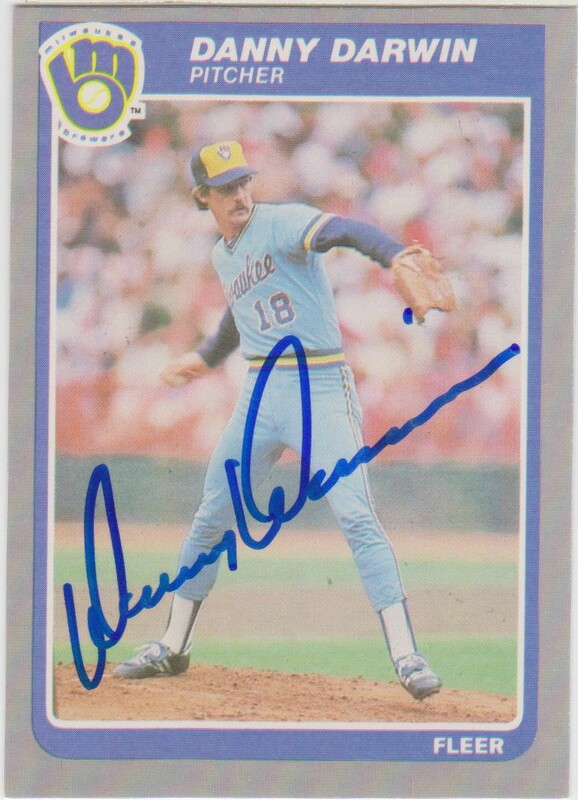 Danny only pitched for the Brewers for a season and a half. 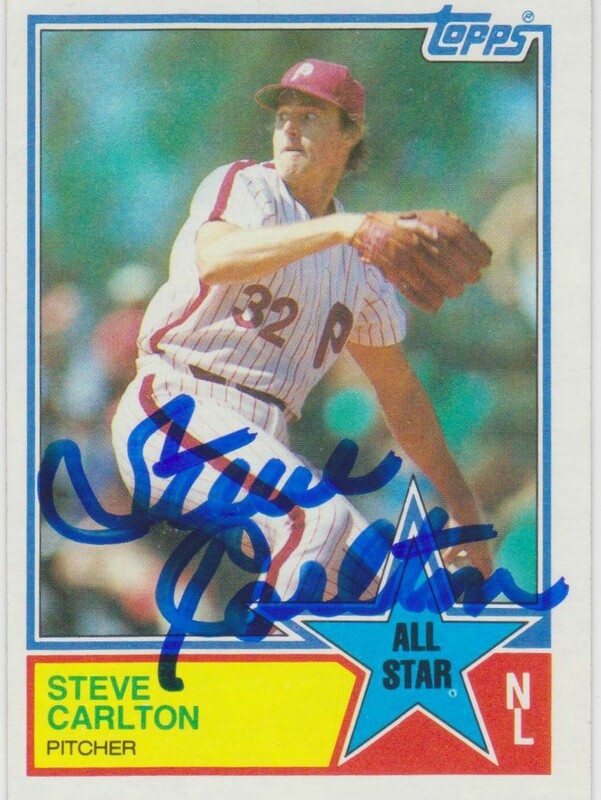 He went there in 1985 as a free agent and pitched there until being traded to the Astros in August of '86. Over that time, he was 14-26 with 2 saves and a 3.70 ERA. I am not sure that I have had a seven year gap between posts of a player on here before. Seeing that number makes me realize that I have had this blog going for nearly ten years now. I started this in 2008 and I always post my cards in order by year. After posting all my cards from a year, I go back and post any cards from previous years that I got recently. The sad thing is that after almost ten years, I still have yet to post any cards that were made during the year I started this blog. By the time I get around to my cards from 2008, it is probably going to be 2018 and very few of those players are going to be relevant anymore. Here is the first of three cards that Don Schulze signed for me in 2015. Don was the pitching coach for the Nashville Sounds and he signed the cards for me before an Omaha Storm Chasers game. Don pitched in the Majors for parts of six seasons with the Cubs, Indians, Mets, Yankees, and Padres. He was mainly a starter in the bigs and he compiled a 15-25 record with 5.47 ERA. 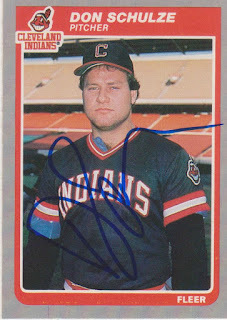 He never won more than four games in a single season, but he did reach ten losses with the Indians in 1985. I hate getting cards signed where the player is wearing a dark jersey. But, in this case, I was having a hard time fining three cards of Don. I was pretty happy with the first two I found and I ended up just settling on this one for lack of better options. It turns out that Don was in the '88 Topps set as a Met, and I never bothered to look for that card. For a dark jersey card, though, the sig on this one actually came out looking fairly decent. It is not much of a signature, but there is not much that can be done about that. The College World Series is not over, but my contest is. 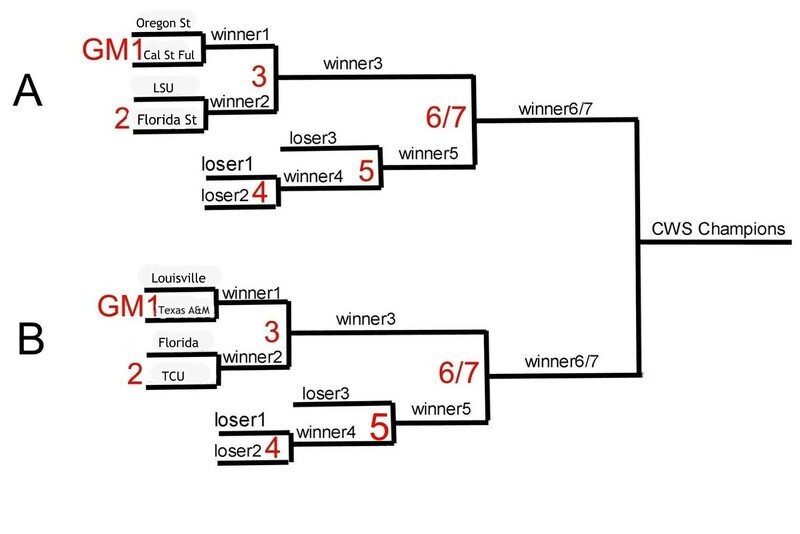 With nobody picking LSU or Florida to win it all, there is no point dragging this thing on. Running away with the contest this year was Wilson! Great job! I do not think I have your address, so please email it to me at zman40 at hotmail dot com and I will get your prize out to you Thursday. As for the prize, I have some bad news. The College World Series quit bringing in former star players to sign autographs at Fanfest. Those signed 8x10s were always my go-to prize for this contest. 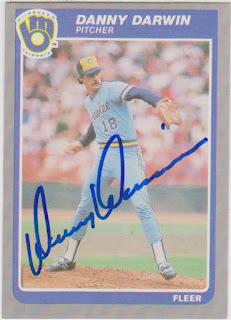 But, I did dig up an old Dennis Eckersly 8x10 that I still had an extra of. 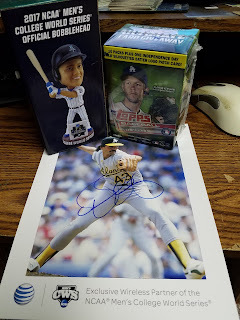 And I am throwing in an official CWS bobblehead stadium giveaway and a blaster of Topps Series 2. Thanks again to all that participated. I hope to see each and everyone of you back next year! In case you haven't noticed, I've been running a little contest here for the past two weeks that revolves around the College World Series. Seven people have already entered and have a tiny head start. But, it is not too late to get in on the action. There are plenty more points to be earned and no one is even close to locking this thing up yet. So here is all you have to do- fill out a College World Series bracket. Keep in mind that this bracket is nothing like filling out a March Madness bracket. The reason for that is because of the loser's bracket. But, I am going to try to make this as simple as I can. Here is my homemade bracket. Click on it to hopefully see a bigger view. Here is a how the bracket breaks down. There are two groups in the bracket- A and B. Each group has six games in it. All you have to do is guess who is going to win each of the games as they advance towards the championship round. For instance, group A has Oregon St. and Cal St. Fullerton squaring off in game 1 and LSU and Florida St. going in game 2. Pick who is going to win each of those games and then those two teams will square off in game 3. The losers of games 1 and 2 will then square off in game 4. Then, the loser in game 3 plays the winner of game 4 in game 5. At that point, there will be one team left in the group that is 2-0 (winner of game 3) and one that is 2-1 (winner of game 5). Those two teams play in game 6, which is an elimination game. If the 2-0 team loses, they play a game 7 and the winner advances to the championship. If the 2-0 team wins game 6, they go straight to the championship without game 7. 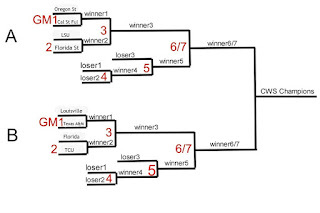 BUT, for the sake of this bracket, I am going to count games 6 and 7 as one game. Just pick who you think is going to advance. It doesn't matter how they do it. I call it game 6/7. After that, you should have a team advancing out of group A. Do the same for group B. Those two teams are your final teams. In the CWS, they play a best of three series for the championship. Pick who you think will win it all and if they will win it in two games or three. Then, for a tie breaker, guess how many runs will be scored in the championship series (the final two or three games). It might be easier for you to fill it out on paper first. But to enter the contest, leave a comment looking something similar to this. For the sake of the tie breaker, DO NOT pick a number already chosen by someone else. Even if your teams do not make it to the finals, the tiebreaker will still apply to you in the event of a tie. If you guess every game right, including how many games will be played in the finals, you can come out with 22 points. The CWS begins at 3:00 PM, eastern, on Saturday, June 17. So, all entries must be in by that point. If you have any questions at all, feel free to email me at zman40 at hotmail dot com. Or, just ask in the comments. To see the standing through this point, see the bottom of the previous post. This thing is anybody's to win. Good luck! Here is another oddball that I was able to get signed at Royals Fanfest in 2014. This is a very blue set that was distributed by the Toronto Star and Midas. I cannot find any info about the set, but they are readily available from COMC, where I got this card. It is fun to note that the only positions listed on the cards are pitcher, catcher, infielder, and outfielder. 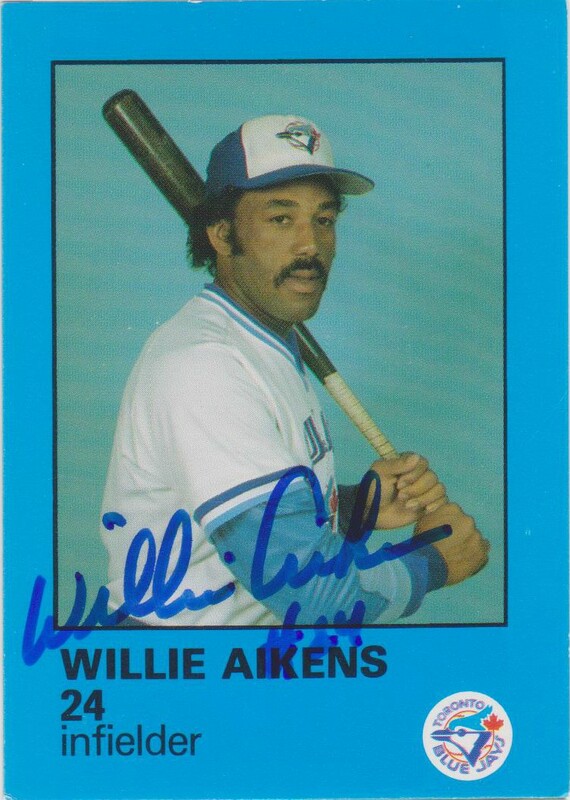 By the time this card came out, Willie Aikens Major League career was pretty much over. He only played in 12 games in 1985, hitting .200 with a double, a dinger, and 5 RBI. That home run that he hit was pretty memorable, though. It was of the pinch hit variety in the top of the ninth to tie the game. The Blue Jays went on to win in the tenth and Willie never played another game in the Major Leagues. The College World Series field is set. Every team that is in was picked by at least one entrant. There were six number one seeds that advanced. There was one two seed and one three seed. Both the two and the three seeds were picked by BMan, who happens to be in the lead. Here are the standings heading into the Series. The bracket portion of the contest will be up shortly. If you see any errors I might have made, let me know in the comments. Here is the last of the three cards that Tom, from The Angels In Order, sent me. The cards were in exchange for getting some cards signed for him at Royals Fanfest. I had gotten three cards signed by Jeff in 2014 when the Grand Prairie AirHogs came to Wichita. 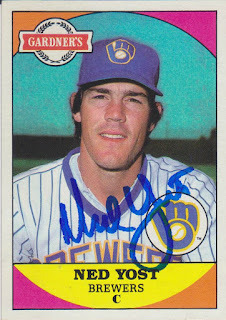 Jeff was the pitching coach for the 'Hogs and I got him to sign cards for me as a Ranger, Red Sox, and Athletic. With the addition of this Reds card, I got a signed card of him with every team he played for except the Indians. On the last card I posted of Willie Wilson, I guessed that the picture was taken at the All Star Game in 1983. This is another example where it is easy to tell when the picture was taken. In the background, you can see a blurry image of Willie McCovey's retired number in San Francisco. Jeff only pitched once in San Fran in 1983 and it was on September 5th. He started that game for the Reds and pitched an eight inning complete game, losing 3-2. He had a no-hitter going into the eighth inning before giving up a lead-off double that was followed by a home run. A runner had scored earlier in the game by walking, moving to second on a sac bunt, third on a wild pitch, and scoring on a sac fly. Jeff finished with just the two hits allowed and five walks and five strikeouts. Three teams have clinched their spots in Omaha. Texas A&M, Oregon State, and Louisville are all in. We will see who gets in today. Here is a card of Willie Wilson that I got signed at Kauffman Stadium in 2015. On Sunday home games, the Royals bring in alumni to sign in their Hall of Fame. Willie happened to be there on that particular afternoon. I was just looking at this card and noticed that the photo was taken at Comiskey Park. As a fan of the '81D, I know Comiskey Park. 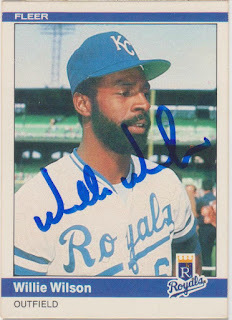 Then I noticed that Willie was in the Royals home whites and wondered what was going on. Turns out that Comiskey hosted the 1983 All Star Game, so that has got to be where this photo was taken. It is not that often that I spot things like that on cardboard. 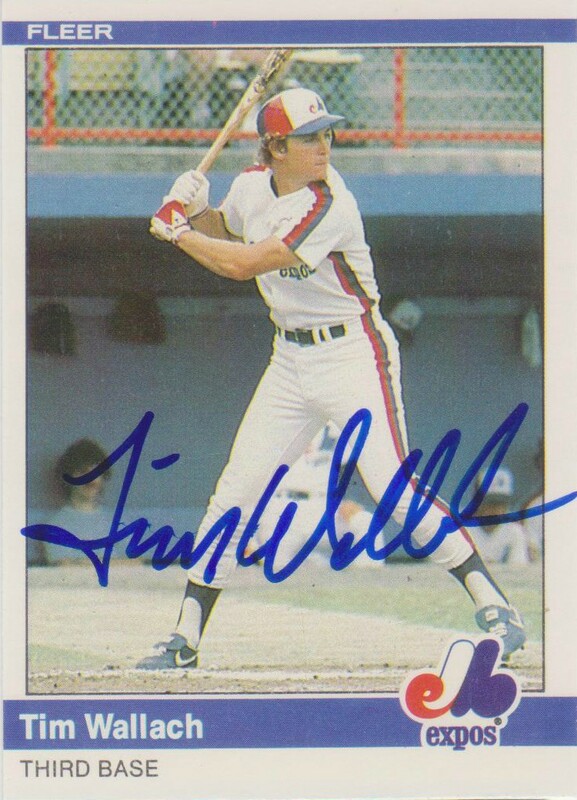 In that '83 All Star Game, Willie got one at-bat and he hit an RBI double off of Pascual Perez. That RBI put the American League up 11-3 en route to a 13-3 victory. The '83 Mid-Summer Classic was the second and final All Star Game that Willie would attend. The Super Regionals started today. Long Beach State, Texas A&M, and Louisville all won their match-ups and Oregon State is about to win theirs. That means that I am a week away from being in Omaha. Here is the second of three cards that Tim Wallach signed for me outside of Kauffman Stadium. If you do not remember the first one, don't feel bad. I posted it three years ago, shortly after Tim signed these. Tim was working for the Dodgers at the time and was the only Dodger coach that signed all three cards for me. Having been going to Royals games for almost twenty years now, it has been a long time since I went to a game really excited to see a certain player play. But, that excitement returned on the evening that the Dodgers came to KC. The reason for that was because I had the privilege of seeing Clayton Kershaw pitch. And, on top of that, it was his first start after his brilliant no-hitter of the Rockies. While Clayton obviously could not pull off the back-to-back no-no, he still pitched an excellent game. He pitched eight innings without allowing a run and struck out eight. Tim is now a coach with the Marlins. He followed Don Mattingly to Miami and is in the same role he was in with the Dodgers, the bench coach. Here is another card of Willie Aikens that I got signed at Royals Fanfest in 2016. But, more importantly, here is a College World Series Contest Update. Here are the Super Regional match-ups. Unless noted, all teams are a one seed. Teams in italics were teams that nobody picked to go to Omaha. Right now, everyone has one seeds alive except for BMan. He still has two twos and a three. Here is how many points everyone can come out with based on the teams that are still alive from their picks. Here is a fun card from what I am guessing is a regional set. Right now, there is only one other card from this set listed on COMC and it too is of a Brewer. Beyond that tiny bit of sleuth work, I know nothing about this set. Nevertheless, it is a unique look from Topps that has the same backs as their regular '83 set. 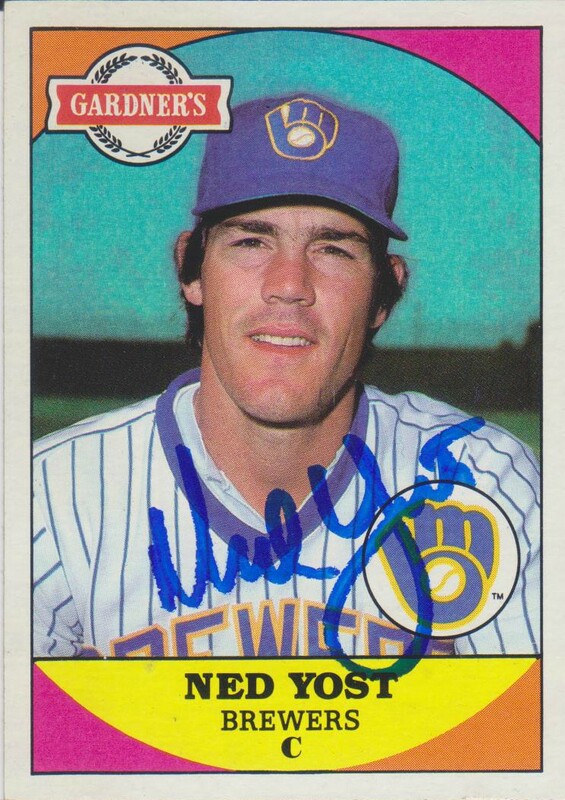 Since Ned is a fairly decent signer, I have to try to find some of these oddballs just to have something new for him to sign. I got lucky this past Fanfest as I was able to get this card and a minor league card of him signed. I would have been much more lucky to get Salvador Perez or Mike Moustakas at that signing, but that is how Royals Fanfest goes. It is a crapshoot. I never understood how these older non-glossy cards get the ever so slight beading from the Sharpie. It does not happen very often, but my mind is always blown when it does. It has been an exciting weekend of regional play. I do not think I have ever seen so many games being played on Monday. Hopefully the Super Regionals will be set in a few hours and I can give an update on Tuesday of who has teams still in it. Here is the second of three cards that Tom, from The Angels In Order, sent me for helping him out with some 'graphs from Royals Fanfest. 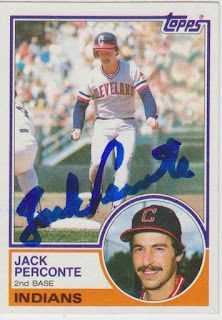 Jack played in the Majors for parts of seven seasons with the Dodgers, Indians, Mariners, and White Sox. He did not see a lot of playing time until he ended up in Seattle in 1984. He was then a regular there for two seasons before ending his career with the White Sox in 1986. For his career, Jack was a .270 hitter with 2 home runs and 76 RBI. His best seasons was with the M's in 1984. That year, he had a career-best average of .294 with 24 doubles and 31 RBI. He even stole 29 bases that season. With regional play starting today, the first phase of the College World Series contest is closed off. Phase two will start in about ten days and you can get back into the contest then. 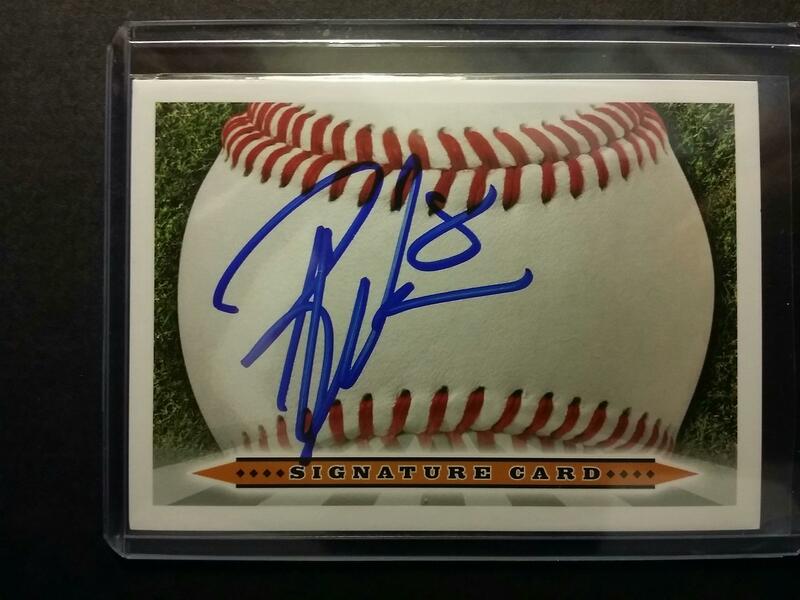 Speaking of the College World Series, here is a card that I got signed there in 2014. While I always get autographs when I make it to the opening weekend, I do not always get cards signed. Quite a few of the players will only sign the 8x10s provided. 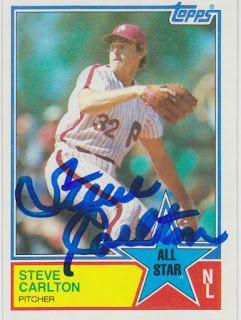 I got lucky in 2014 and got 8x10s and cards signed by both Steve Carlton and Dennis Eckersly. I really like the 1983 Topps set. Having the second inset picture was a cool addition, in my opinion. Even though the All Star cards lack the inset picture, I still love the way they came out looking. I miss when the days when Topps had a redesigned All Star subset. Nowadays, they just add a logo to what basically looks like a base card. I'll be heading up to Omaha two weeks from Friday. I am already getting a little anxious to see who AT&T is going to bring in for autograph sessions. 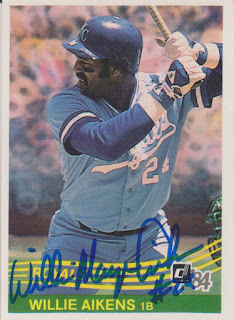 I hope it is someone new that signs cards and is a need for the '81 Donruss set.